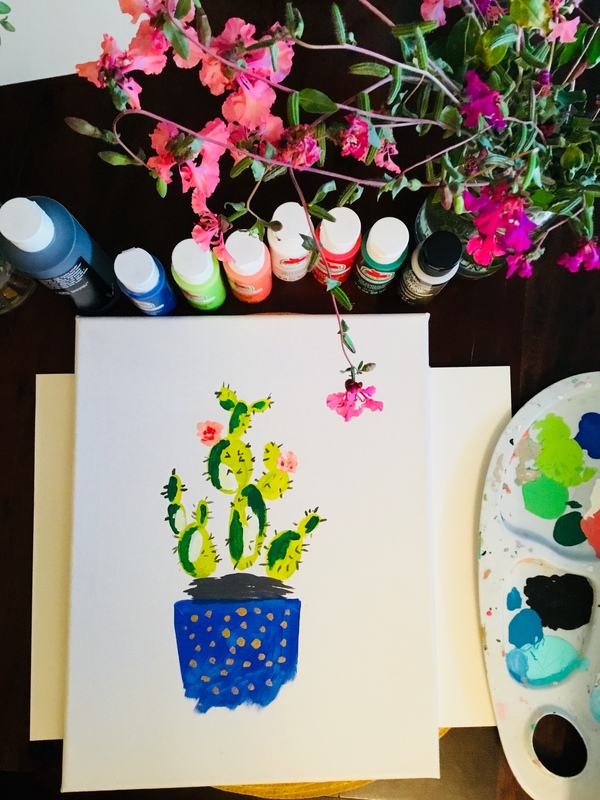 This week, I’m putting out a fun time lapse on how I taught my daughters how to paint a cactus in a pot. I also taught this as a class at our local library and it turned out really well. I love how kids have their own spin on art. 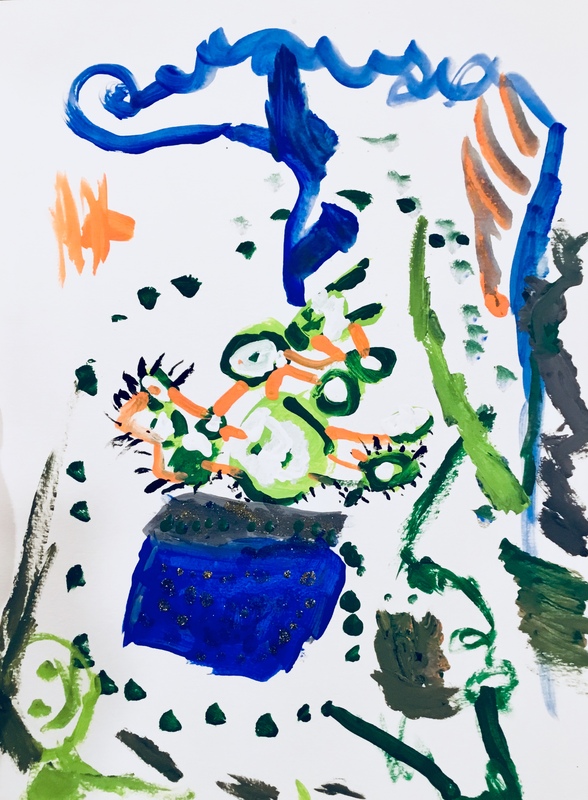 I started this project with some acrylic paints, water, paper towels, watercolor paper or canvas and paper plates as palettes. The painting is actually really super simple if you break it down into a few steps. You can watch the video here for help but I will also go through the steps here so you can use both as directions. Start with some lime green and create some oval shapes of different sizes. Add a dark green shading on a few sides of the cacti to create depth. Mix black and white to create a dark gray. Use your brush in a horizontal motion to create a stone base for the cacti. Next use a bright blue or color of your choice to create a simple pot for the cactus and stones. Add white as a highlight to the center of a few cactus ovals. Mix peach and white loosely so that both colors are still present and use the marbled peach-white to create some simple flowers. Add a tiny bit of red detail to the flowers to create depth. Add gold dots to the pot to give it some detail. These directions are really flexible and look best when you customize them to your own liking. Feel free to place the flowers wherever you want and add a background. Many of my students took off with this project and it turned out amazing! 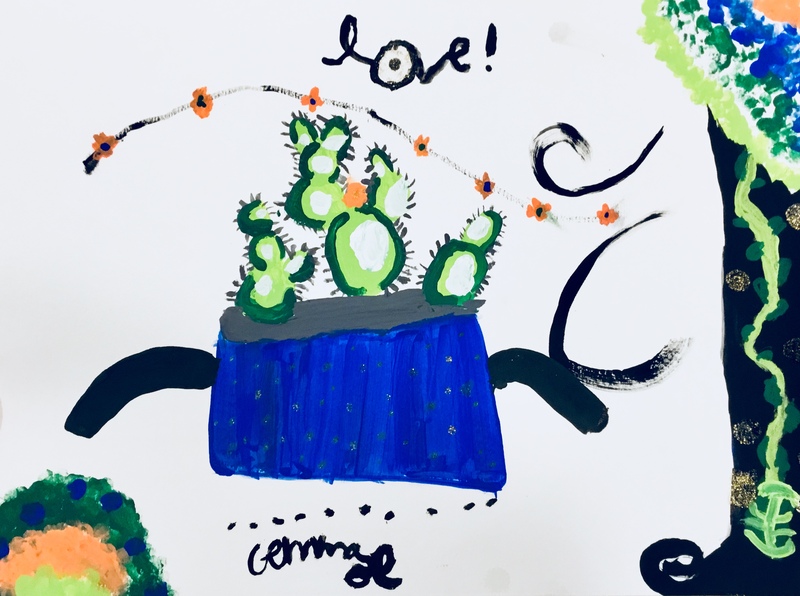 This cactus tutorial is really great for teaching to kids or adults in a medium sized group. It’s not too difficult and can easily be modified with different colors and ideas. Don’t forget to check out the video tutorial here and use it with the step by step directions above.